Today I'm dedicating my post to a little patient of mine who was my friend for a year. 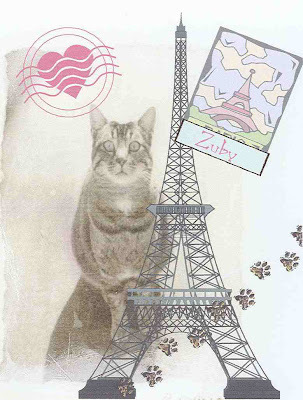 She was a tiny, twenty-one year old tabby cat from Paris, and her name was Zuby. I became her nurse for the same reason I see lots of cats; kidney disease. I gave her fluids every other day and she never made a peep until the very end, which is one sign we knew it was time to let her go. She always sat there and purred, and often times she'd lift a paw to my face as if to ask "So how are YOU doing today?" When the weather was nice I'd carry her out to the garden and lean her into the roses. We'd talk about the birds that stopped by, or the little squirrel who used to like to check her out. Zuby would put her face up to the sun and smile, I swear. She had a wonderful, loving home. As she started to slip away, the home became too big and overwhelming for her. She paced and howled and became anxious and unsettled. She spat at me for the last three treatments as if telling me not to bother anymore. So finally, I didn't. Zuby's mom Marilyn always said she'd never force a situation on her, and my philosophy is to continue treatments only if the quality of life is still there. She was like the energizer bunny though! Sometimes Zuby's mom and I would get all choked up thinking "today's the day" only to have Zuby rally and look at us as if we were nuts, and then she'd go over and eat a whole dish of food! Clearly though, Zuby was different on that final day. Her eyes were hollow and vacuous. She only wanted to be held. Her body had given her twenty-one great years and it had nothing left. The vet came to the house and I gently assisted him. Her mom and another friend were there and we all raised a glass of wine in celebration of her life. She left us the same way she lived, with amazing grace. A tiny cat with a huge capacity of love for life. She left her pawprints on many, many hearts. Her mom is going to bring Zuby's ashes back to Paris one day to complete the cycle. Tell me that isn't love! Happy Animal Wednesday, my friends. Here's to Zuby! OMG Lolo this story brought me to tears. Beautiful tribute to this beautiful creature! How wonderful that you could make such a difference for her. wow, I was so sorry to hear about Zuby, but I know you gave her such great care and love, she did so well with your help. What a beautiful tribute, too! here's to Zuby! I had to go get a kleenex. Animals stories are always so touching. Thanks for the telling. sniff, sniff, how sad, I lost one of my dear kitties to kidney failure as well, so I say to you Zuby, au revoir mon petit chou-chou, dormez bien! OMG...this did make me cry! How wonderful you are able to help the pets live a long, healthy life. Zuby was special...and your writing about her was so touching and really was heartfelt! God bless you for what you do for the animals and the humans!!! This is so sad, but what a lucky kitty to have people who loved and held and helped her little soul onwards...you are such a compassionate person Laurel. HAW to you. Oh, this is so sad and loving it brought tears to my eyes! How lucky Zuby was to have so much love and caring in her final year, and how lucky you were to get to love her and take care of her. My own darling cat is now 19 years and counting - still healthy, but I know I will soon loose him, and that will break my heart. But when he wants to go, I own it to him to let him go. Just like you did with Zuby. You have a great heart for animal, moreover for this cutie poor cat Zuby. YOU ARE THE BEST. ALL OF THE PETS YOU HAVE LOVED AND CARED FOR OVER THE YEARS ARE WAITING FOR YOU IN HEAVEN. Gosh! You make me cry! Sniffing! Aw, my heart is heavy for you. I remember you telling me about her and the way she'd lift her wee paw to you face. Such a special little soul. So sorry for you and Marilyn. What a beautiful tribute you made to Zuby, she was so obviously loved! This is a beautoiful story (and a lovely collage). Thanks for sharing it.